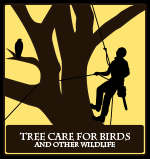 The Tree Care for Birds and other Wildlife project has not developed a wildlife aware training program for arborists. Those listed below are options which we can recommend at this time. We do not guarantee the quality of the work or programs provided by any individual or entity listed here. Sims Tree Learning Center: register for their next class on 4 April in Jurupa Valley, CA. Urban Forestry Today (12-14-17) from Rick Harper on Vimeo.